So just like every other smartphone launched by Samsung which less people tend to care about, we now once again have a similar looking Samsung device called the Samsung Galaxy Alpha. Samsung claims to entering into new segment with its all new metal clad Alpha. Seriously its hard keeping count on the number of devices launched in a year by this Korean Smartphone giant, and I event tend to care less. So, now its launched the Samsung Galaxy Alpha with a price marginally higher than the Samsung Galaxy S5 but features wise its looks like a stripped down version of the latter. Just in some time, I’ll give you enough reasons to avoid buying the Samsung Galaxy Alpha but before that lets take a brief specifications overview of this new horse in its stable. This new smartphone comes with a Samsung Exynox 5 5430 Octa Core Processor along with 2GB of RAM. It has a 4.7 inches HD Super AMOLED display with provides 312 ppi. Internal memory clocks at 32GB with no option to expand. The front camera is 2.1 MP whereas the primary camera is 12MP capable of recording 4K videos. The better part is, it comes with metal band around it edges which does gives it a premium finish. Anyways you can check out the whole specifications list by clicking here. Now, let’s move on the part that you’ve all been waiting for. The reason why I’d avoid buying the Samsung Galaxy Alpha. Ok! So a price of Rs. 37,999 ($890) and what its got to offer? Only a 1860mAh of Battery. Duh! Even the Samsung Galaxy Note 3 Neo price Rs. 15,000 lowers packs in a better 3000mAh battery or for that matter my Asus Zenfone 5 priced at Rs. 9,999 offers a 2110 mAh battery. Should I say 250 mAh more than the Samsung Galaxy Alpha. Gaming from 100% to 0% charge, this smartphone survives a little shy of 3 hours whereas my budget Asus Zenfone 5 manages a pretty more than 4 hours. Recently I did a review of the Asus Zenfone 5 which can play Asphalt 8, FIFA 14, Blood Trigger 2, Blood and Glory: Legend and other HD games with ease at a price of Rs. 8,499. So before moving on why not check it out? Hope you haven’t missed to check the Asus Zenfone 5 Review as its an one hell of a budget Gaming beast priced at only Rs. 9,999. Anyways, here’s the number 2nd. Did you know? The Samsung Galaxy S5 cost Rs. 1000 less than Samsung Galaxy Alpha but has a 1080p Full HD Super AMOLED display whereas the Alpha costing more than the company’s flagship comes with only a 720p HD Super AMOLED display. Only Samsung knows why. I mean a man with basic logic and understanding of simple tech terms will choose the S5 anyday over the Samsung Galaxy Alpha. This phone has a metal clad design – GREAT. Its weighs only 115 grams – AWESOME but what about design? It has been ages that this Korean Smartphone Giant has been producing similar looking smartphones only with different sizes and prices. Now its not a major problem but steals off exclusivity of owning a Premium, higher-than-my-monthly-salary smartphone. Even a tech geek like me usually has problems distinguishing a Samsung Galaxy Grand 2 from a Samsung Galaxy S4 during my travel in Mumbai Locals. Imagine how redfaced a man would feel using a Galaxy S4 and people asking him is this the new Grand 2. God Bless Samsung, cuz’ we ain’t even closer to that. Though it’s a norm not providing expandable memory on premium smartphones but if the company can do in its flagship smartphone then why not on the new Samsung Galaxy Alpha? Doesn’t the Alpha costs a little more than the S5? Samsung has slapped itself hard by providing a 12MP Camera instead of a 16MP one. Look we don’t have problem with a 12MP shooter as its clicks good pictures and records 4K videos but things start to itch when Samsung Galaxy Alpha sits at such a high price. Anyone disagrees with me on this part? Comment below if you do. 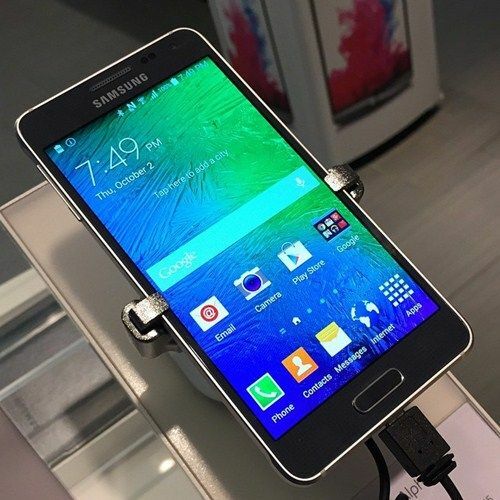 Many reviews found out one or two glitches with Samsung Galaxy Alpha’s Finger Print Scanner. I believe this to be a software issue rather than a hardware fault. Maybe we could have a better functioning and more finger print scanner in future software updates. So you shell out Rs. 37,999 for not even a semi-flagship smartphone and show it to your friends. Imagine the back panel quick-and-quack when you remove it show the innards to your friends just like a cheap Karbonn smartphone. Technically not a problem but still its kills the value of buying a costlier-than-flagship smartphone device. To be true the Zen UI on my Asus Zenfone 5 looks a lot more exciting and modern than the TouchWiz. This is the reason why I suggest most of my friends using a Galaxy smartphone to install a custom launcher. This is the reason why I never head to Samsung section when buying or suggesting someone a smartphone. 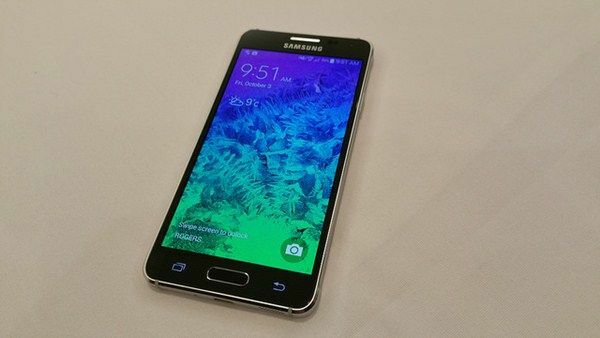 To be frank, the only reason to not buy the Samsung Galaxy Alpha is its high price. Practically it’s a great device with good set of features and performance marginally better than the S5 (in synthetic benchmarks) but we’re upset about the price it sits at. For a longer time we have been asking a metal clad smartphone from this Korean but not a budget than burns a hole in wallet of the entire family. It just has metal around its edges and not entirely curved in metal like the HTC One M8. To be frank you won’t be disappointed by Samsung Galaxy Alpha if you forget the price you pay as soon as you buy it. It’s a great set of a device. If you want to be one of those logical tech consumer, it makes more sense buying the Samsung Galaxy S5 over the Alpha any given day. So what are your thoughts on this topic? Any point you disagree or agree with me; do let me know in the comments section. If you love my article please share this article as it helps me keep this blog alive and providing such information to my lovely readers like YOU. How can Samsung, who still is world’s top smartphone manufacturer make huge mistakes like these on their devices? I guess they are preparing to lose their position now! Even I am feeling these days that Samsung needs a change. I don’t even like to see a Samsung device now. Same shape, same UI, same features. Like you, I too have trouble in distinguishing a Samsung smartphone from the other. Talking about change, even our holy book BHAGVAD GITA says that “Change is the rule of the world!”. Why can’t Samsung change? To be honest, when I looked at your post title, I couldn’t believe that this is possible. But after reading your article, I must say its true! 720p resolution in a flagship was a bit surprising for me. Why is Samsung doing this? Believe me, if it goes on like this, Samsung will have to reduce the price of this smartphone! Your Zenfone 5 is better than this! According to me rather than buying samsung devices we should now switch to Motorola or LG or any other brand. These days android manufacturing brands are increasing at a lightning speed. When it comes to buying a new android phone, it becomes really tough to choose one from the market. But obviously samsung is really ruining up its market and galaxy alpha is the real proof to it. Very interesting post, I enjoyed this and I have bookmarked this page for future. I am going to implement all things soon. A big thanks to share this awesome post with us.